It's been a rather busy week around here catching everyone up on what's new for 2010. Today we're taking a look at new uniforms around the AHL. A handful of teams will wear new home and road sweaters beginning this season. Others are simply adding third jerseys. But a special group will sport throwback jerseys that pay tribute to the earliest days of the American Hockey League. All of this is outlined in today's edition of the Icethetics Season Preview. Syracuse Crunch get new sweatersOn July 29, the Syracuse Crunch unveiled new sweaters to go with their new colors. Earlier this summer, the Crunch announced a new affiliation agreement with the Anaheim Ducks, which included switching to the parent club's colors. You saw the new logo here on Tuesday's Season Preview post. The new jerseys featured the Ducks' "webbed-D" logo on the shoulders as well as a standard Reebok Edge striping pattern in black, orange and gold. Falcons reveal new sweatersLike the Crunch, the Springfield Falcons also joined up with a new NHL partner. Last spring, on March 25, the Falcons announced the new agreement with the Columbus Blue Jackets and unveiled a recolored logo and uniforms. At the unveiling, only drawings of the jerseys were on display. We still haven't gotten a look at the physical sweater itself, but the season is right around the corner and we'll be able to see it in action soon enough. 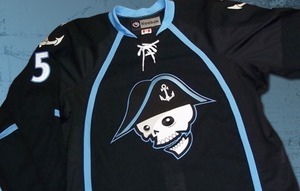 Milwaukee Admirals unveil road jerseyThe Milwaukee Admirals are ditching the gray road jersey for a new black one. The unveiled the new threads on back Aug. 5 via their website. The team's press release expressed excitement for the new look. Certainly that logo looks much better on black than it did on the old grays. My guess is the old one wasn't as easy to distinguish from the home team wearing white — at least for TV cameras. Also new, the Albany Devils and Oklahoma City Barons weren't around last season, so clearly they will have uniforms that will hit the ice for the first time in 2010 — sort of. Both the Devils and Barons will wear the same thing as their NHL parent clubs, only with their own primary logos on the front. So no big surprises there. Checkers unveil new uniformsThe Charlotte Checkers, formerly the Albany River Rats, unveiled three new sweaters on June 25 at an event for fans. Like the Devils and Barons, the Checkers' sweaters are identical to those of the Hurricanes, their big league affiliate. The only difference is the logos on the front and shoulders. The Checkers are using the same primary logo as the ECHL team of the same name from last year. The owner of that team bought the River Rats, relocated them and re-appropriated the moniker. Unfortunately, I'm running out of time to write this update (what with having an actual job and all). So instead of writing something new for each of the three teams that have released new third jerseys, I'm just going to post pictures here with links back to their original blog post for now. The Rochester American, Wilkes-Barre/Scranton Penguins and Hershey Bears unveiled new alternate sweaters over the summer. If I missed any new AHL third jerseys, you guys will have to let me know. As part of the AHL's 75th anniversary celebrations, six of the league's oldest cities will see their teams open the season by squaring off in retro uniforms. That's the schedule an the logos that will be worn. 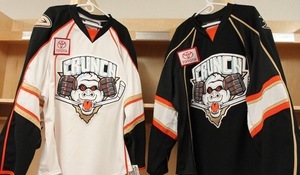 To date, only the Springfield Falcons/Indians and Syracuse Crunch/Stars retro sweaters have been officially revealed. If you'd like to see those, the AHL has set up a special image gallery on its website. I apologize if the end of this post felt rushed, but I'm keeping pretty busy lately. Tomorrow's update of NHL JerseyWatch 2010 will be as comprehensive as possible and will wrap up the Season Preview. Then as a bonus, a handful of Canadian Hockey League teams have unveiled third jersey. On Saturday, we'll be taking a look at some of those.